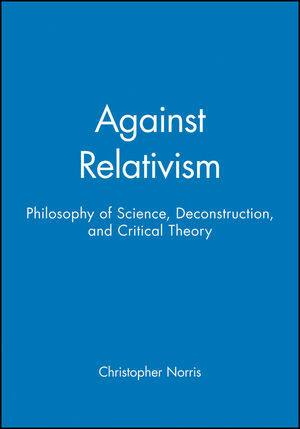 This book offers a vigorous and constructive challenge to relativism by examining a wide range of anti-realist theories, and in response offering a variety of arguments amounting to a strong defence of critical realism in the natural and social sciences. Christopher Norris is Professor of Philosophy at the University of Wales in Cardiff, and an Associate Fellow of the Centre of Research in Philosophy and Literature at Warwick University. His work has been widely published in both British and American journals, and he is author of thirteen books to date, including Uncritical Theory: postmodernism, intellectuals and the Gulf War (1992), The Truth About Postmodernism (1993) and Truth and the Ethics of Criticism (1994). 1. Metaphor, Concept, and Theory-Change: Deconstruction as Critical Ontology. 2. Deconstruction and Epistemology: Bachelard, Derrida, de Man. 3. Ontological Relativity and Meaning-Variance: A Critical-Constructive Review. 4. Deconstructing Anti-Realism: Quantum Mechanics and Interpretation-Theory. 5. Hermeneutics, Anti-Realism, and Philosophy of Science. 6. Anti-Realism and Constructive Empiricism: Is There a (Real) Difference?. 7. Ontology According to Van Frassen: Some Problems with Constructive Empiricism. 8. Stuck in the Mangle: Sociology of Science and its Discontents. 9. But Will It Fly? Aerodynamics as a Test-Case for Anti-Realism. 10. Why Strong Sociologists Abhor a Vacuum: Shapin and Schaffer on the Boyle/Hobbes Controversy. 11. Leviathan and the Turbojet: A Critique of Sociological Unreason. Engages readers in issues of current interest in critical theory, deconstruction and philosophy of science. Includes an extensive bibliography at end of each chapter. Lucid writing style to appeal to both specialists and non-specialists.